Arggh…… What is that thing call? Ever have something that bugs you all the time and yet, you can’t find the answer? I tried Google It but can’t find what I wanted. Blame this on Samm who tagged me on some childhood food meme. I wanted to write something about coconuts. Instead, I am now transported back to my childhood. 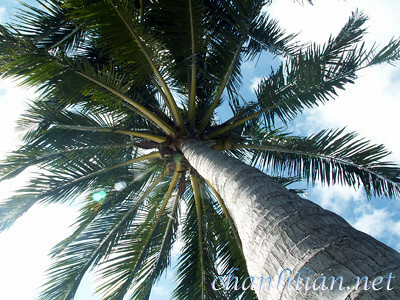 I lived in a little village (kampung la) with swaying coconut palms. But life is not that idyllic because old nuts are life-threatening. They can and had dropped on people’s heads, cracking the skull and the person dropped dead on the spot. When I was born, i.e. when my mom was in the hospital, labouring to deliver me, a coconut tree fell on our kitchen roof. Dramatic ya? Then, I remember catching some black beetles with orangey stripe from coconut trees and tie their leg with a thread (just one leg). After that, I have a live flying beetle on remote control! It was so fun having the creature buzz-buzzing and yet, can’t fly away. After a few days of torturing it, I think I let it go….or did I fry and eat it? Hmmm…can’t remember. 1) My mom used to make sagun for me from grated coconut. She dry fried the grated coconut with sugar and some tapioca flour (if I remember correctly) till it becomes crispy, sweet, milky powdery stuffs. Put them in your mouth and talk. Woo hoo, nice. The crumbs fly all over. *piak* Got slapped for sure. 2) Coconut oil is heavenly. They smell so lovely. Who knows the name of the white, bulbous thing in old coconuts? It is crunchy and sweet. In Hokkien, we call it ‘tombong’. I know fish fish’s food blog had featured it before but fish fish’s blog has no search box. Plus it is not nice to ask fish fish for the link on her birthday. Sigh…I think I will go find some coconut leaves and make lidi brooms. Hey, it was therapeutic to slice off the green leaves, leaving the hard twig-like stems. Dry it under the sun for a few days and tie those tiny twigs into a bunch and there you have it, a broom. Very similar to those used by witches, and Harry Potter. Who can tell me the name of the white thing and what is it? The prize is an old coconut. By LilianIn UncategorizedTagged Life rants25 Comments on Arggh…… What is that thing call? Next Next post: Armpit hairs are gross, ok? You have been officially….. TAGGED! kekeke, please visit my site for details. Thank you! Haha, thank god i got ya first. My, u’re HOT hoh. EEERRRM, sorry, i’m not of much help on ur coconut thingy. romantic, when you said that the white thing is ‘heart’ I think you actually meant jantung pisang (which is not the white thing). Sorry, Lillian, I have no idea what it is called. q – I Google. Umbut is something from palm trees but this one is inside the coconut itself. 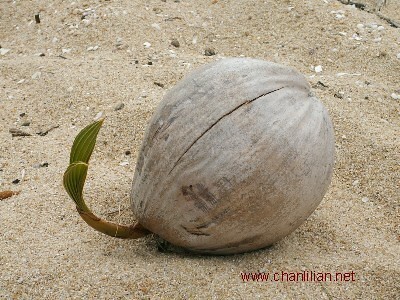 Romantic – Yeah, it is like a heart, the size of a small apple inside the coconut. Samm & JoeC – I think it was Boo_licious of masak-masak who tagged me, months ago. So, Joe is the third one. lilian, i know wat u’re talking abt, i love it too. damn nice!! daddy used to take it from the market for me coz all the coconut/santan sellers dun want it. umbut is not right either. Isn’t that the coconut heart? But usually use young coconuts ba? Hey, in Hakka, it is called Zai Pong. Yap… it is heavenly yummy!! Got such thing meh?? I thought it’s the coconut flesh??? (those u get when u buy coconut drink… ) OK, I’ll check out the link. got lar helen..how come u dunno wan? i oso know n i LOVE it! Here it is in scientific terms. The white fleshy edible part is the testa with an albuminous endosperm, the coconut meat. When dried it is known as Copra. remember there was an old hokkian song called “ung ku kau tambong”? I am lazy, I just check it out wikipedia. Any plant seed start germination must be taken with great care. Naturally the seed will produce some poison to protect themself from being eaten. Yeah, I am the google and wiki spoiler kekekekekekeke. “mia” Isnt jantung pisang the flower?? btw, ever tried the very soft & crunchy skin ( tempurung) of coconut that is cooked with curry… sheer heaven, beats umbut kelapa anytime! And the old coconut prize goes to everyone for the suggestions! Thank you for solving the mystery. For those who are too lazy to check the kew garden url, it is called “Coconut Apple”.